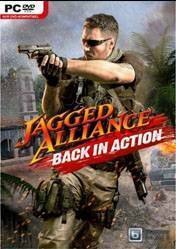 The Jagged Alliance games center on strategically controlling mercenary squads, on and off the field, who complete various missions such as freeing countries from oppressive dictators. A sticky phrase describes these games as "X-COM with personality." The games feature a unique mix of turn-based battle simulation, 4X (eXpand, eXploit, eXplore and eXterminate) elements and role-playing video game. Sharp humour via spoken character comments is a trademark of the series. The personalities of the individual mercenaries range from mildly eccentric to obviously disturbed, and their spoken lines give the games a cartoon-like quality. This contrasts the games' setting which is otherwise closely linked to such subjects as war and death; the intent is to avoid a false sense of realism and overt references to real political events Each mercenary is an individual with their own traits, and fans quickly selected their favourites from the lot (such as the dour, bearskin-cap wearing Ivan Dolvich, who spoke only Russian in the original game and broken English in the sequel). Part of the strategy and genius in the game was the player's freedom to select a multi-faceted team to win the game in different ways. There are no comments yet about Jagged Alliance Back in Action . You can be the first one!